At the age of 8, Yasmina got her first horse, with the help of her mentor the Lebanese champion Karim Fares who is also an International rider and trainer. Over the years, Yasmina achieved outstanding successes both in Lebanon and abroad. 2018 is a very particular year for Yasmina. Not only she is the actual Lebanese champion in the senior A series, winning this title at only 15 years old, but she is getting ready for several important international competitions. This past July, she participated in Belgium for 2 weeks, in one of the most recognized international show. At the end of that month, she was qualified for the French championship for the cadets category, under 16 years. In September, Yasmina with only 20 riders worldwide, was qualified to compete for the world jumping challenge, in Uzbekistan ! Following her impressive scores and podium wins in France, 3rd at La Baule, then 1st at the French national competition at Le Mans and 1st at the international race in Knokke (Belgium), our young champion did it again in Lebanon. After winning at the World Jumping Challenge (the only international contest in Lebanon organized by the Fédération Équestre Internationale), which qualified her to participate in the FEI World Jumping Challenge Final in Uzbekistan in 2018; she won, in October, the three Coupe du Liban, followed by the Championnat du Liban cup in November. The unbeatable and forceful Yasmina Bocti, the young horse-back rider sponsored by Fondation Saradar for the third year in a row, has succeeded again in heading the Junior category (the series C). Recently, she won the Coupe du Liban, the Championnat du Liban and the Coupe de l’Indépendance during the months of October and November. Not only she has imposed herself as a major competitor on the local scene but she has reached excellent ranking in Europe as well. In fact, Yasmina is participating in international competitions since 2015, mainly in one of the world most prestigious event the Longines Masters de Paris. Yasmina arrived 1st in the E category at Zeghrine Equestrian Club in March and at the Valley Club in April ! During the year, she also achieved great results in the Lier international competition (Belgium) May 1st, where she participated in the International Children category (12-14 years) Grand Prix final. 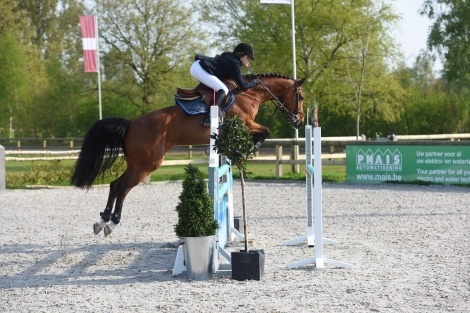 Competing against European champions on a horse assigned to her in Lier: she arrived 2nd in the 1m10 series ! In April 2014, Yasmina participated in her first international show in Hagen, one of the most popular horse shows in Germany. Her results were very encouraging, and she was the youngest rider in the 4 Star Riders Tour. During summer 2014, she reached the highest step of the podium 4 times at The Faqra Club Weekend Tour. Yasmina Bocti is a unique talented horseback rider with a great future ahead of her.